The Enola Gay is the B-29 Superfortress bomber which dropped the first atomic bomb, code-named "Little Boy", to be used in war by the United States Army Air Forces (USAAF) in the attack on Hiroshima, Japan on 6 August 1945, just before the end of World War II. Because of the bomber's role in the atomic bombings of Japan, its name has been synonymous with the controversy over the bombings themselves. 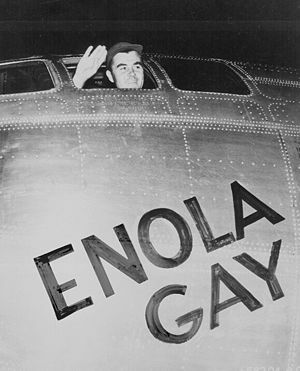 The B-29 was named after Enola Gay Tibbets, the mother of the pilot, Paul Tibbets. Photograph of the Enola Gay crew members, signed by Paul Tibbets, Theodore Vankirk, Bob Lewis, and Joe Stibork. It has the photo of the 9 members, signed by the 4 mentioned above. 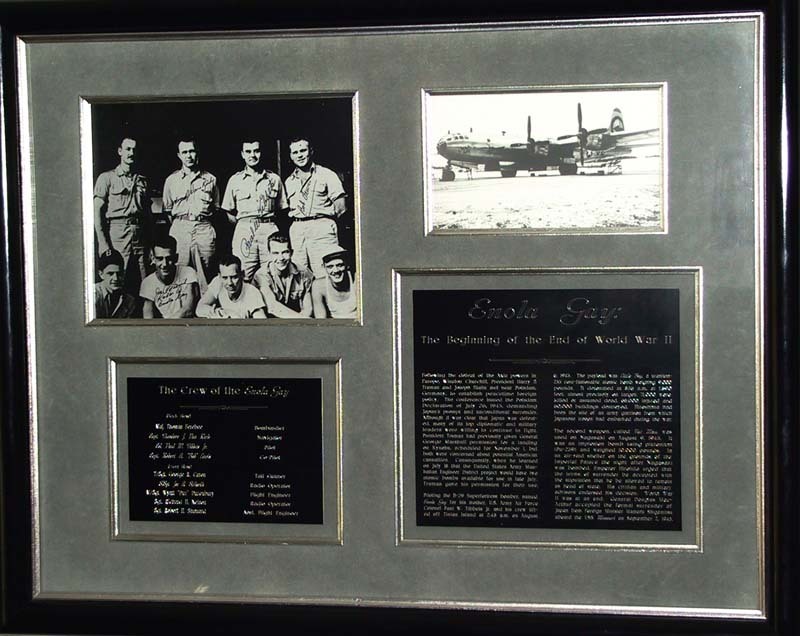 It also has a photo of the Enola Gay aircraft plus a plaque with a synopsis of the events as they occurred. It is framed in museum quality mount and glass and was originally purchased as a collectors item. The Enola Gay collectible display was generously donated to the Canadian Vietnam Veterans Association (MB) by MARCIA BARYLUK of Winnipeg, Manitoba, Canada. Marcia wished to donate this historical display to a veterans organization that can appreciate its historical significance. Marcia also provided us with the original "Certificate of Authenticity" as proof of collectors item.